My 2014 No Advertising Please campaign, while aimed at all doctors, ended up impacting mainly on GPs. The pledge not to see drug reps is more easily fulfilled when one is in autonomous, private medical practice. However, it is equally important that prescribers working in hospitals choose their medications on the basis of best evidence rather than marketing. In today’s Medical Journal of Australia (MJA), I co-author a paper with Monash doctors Dr Jessica Dean and Prof Erwin Loh. We call for a severing of ties between pharmaceutical sponsorship and hospital-based medical education. Jessica is former President of the Australian Medical Students’ Association (AMSA) which was the first Australian medical organisation to completely remove reliance on pharmaceutical sponsorship. Jessica points out in the accompanying MJA video (*warning – a little long!) that modern med students are now well versed in avoiding pharma influence during training, and therefore tend to get a surprise when they enter the hospital system as professionals and suddenly note the number of sponsored lunchtime meetings. Our full article is available on the MJA website here. This entry was posted in medical education, Naked Doctor and tagged medical student, MJA, naked doctor, NAP, pharmaceutical. Bookmark the permalink. I applaud the stance taken by you and your co-authors and hope to see the change of attitude you endorse spread through the medical profession. 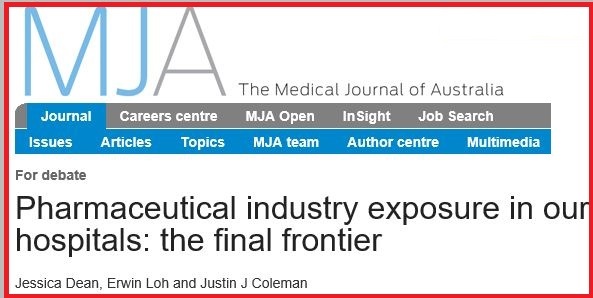 I also couldn’t help smiling at the irony of the MJA publishing a piece that warns against how pharmaceutical company marketing can compromise evidence-based medicine. However I would caution against any smugness with regards to the possible influence more subtle forms marketing, such as those transmitted to you by colleagues who have been designated ‘key opinion leaders’ or due to pressure from astroturfed patient groups, might have on your own practice. Everyone believes themselves immune to marketing but studies suggest we are all wrong. I have reservations about the exceptions you make for “industry-sponsored clinical trials and research studies in hospitals”. As long as ethics committees continue to approve trials in which the sponsor retains control over the data or which are carried out by researchers with a history of failing to publish their results the evidence available to practitioners will continue to be systemically skewed to the benefit of Big Pharma and to the detriment of patients. I was recently a beneficiary of a hospital-based ‘trial’ of one of the new hepatitis C treatments. I’m not one to throw the phrase ‘medical breakthrough’ around with abandon but these treatments really are. But despite my good fortune in gaining access to over $100,000 worth of pills for less than $50 I seriously doubt my ‘trial’ was really an overall benefit to patients or to the health system. The drugs I took had already come through phase 3 with flying colours. My trial was part of a ‘compassionate program’ involving 400 patients spread around dozens of hospitals worldwide with no real attempt to standardise methodology, selection criteria or data gathering. It was essentially a seeding trial, aimed at turning patients and medical professionals into advocates for the product. All well and good you might say. After all, the treatment is a huge leap forward from the old interferon/ribavirin therapies. But the price is exhorbitant. No. It’s extortionate. That sort of drug company price gouging is what’s undermining the financial viability of the PBS and bringing public health budgets worldwide to their knees. I hardly think that represents a benefit to patients in the long term. Sure enough, patients and clinicians have been heavily lobbying the government to subsidise the new HCV treatments and the Health Minister recently relented, setting aside $1 billion for the new drugs to “eradicate hepatitis C from Australia”. But given the courses cost around $100,000 and there are probably over 200,000 HCV carriers in the country … well, you can do the math. (BTW, Indian companies manufacture generic versions of the new drugs for less than $1000 per course, but under various ‘free’ trade treaties Australia has signed we aren’t allowed to import them). I agree that hospital-based research is a more complex issue than our brief tick of approval might imply. As you say, hospitals should ideally only participate (and ask their patients to participate) if the research data is made transparent for independent analysis after the trial. And I also agree that the whole Hep C drug funding approval has been a dodgy process. As a GP, I received petitions from a hepatitis patient advocacy group that looked like they came straight from the pharma marketer’s printer. Everything about how to pressure government to agree to the exorbitant price, and absolutely nothing about pressuring the manufacturer to drop the price. Very disappointing, from a society that purports to have its members’ interests at heart. As a GP, I received petitions from a hepatitis patient advocacy group that looked like they came straight from the pharma marketer’s printer. I sure hope they did. I’d hate to think they write that sort of stuff themselves. On reflection, it’s probably the burgeoning grey market in Indian pills that got the drugs listed. Western drug companies were in danger of losing most of their sales and I doubt authorities would have liked to publicly confront the patient groups importing them on the question of our WTO obligations to Big Pharma.